Hear from industry experts on the trends that are shaping local search and advertising. From a search for a business, to the aisles they roam in the store, to the goods and services they purchase, customers' activities are becoming user profiles, cookied paths and stored purchase histories that help real-world businesses to track them -- as much to retain customers as to make that customer experience better suited to the individual and less frustrating. There is no better way to ensure happy customers than by delivering them accurate information about your business. Who best to help you distribute and regularly update your data? With myriad complexities in the marketplace and hundreds if not thousands of websites publishing business information, SMBs need to choose the right partner to ensure accuracy. This webinar looks at the landscape and outlines the key questions to ask to ensure their business information will have value to the consumer. Smartphone penetration is around 50% of the population, but fewer than 5% of small businesses have websites optimized for those potential customers. 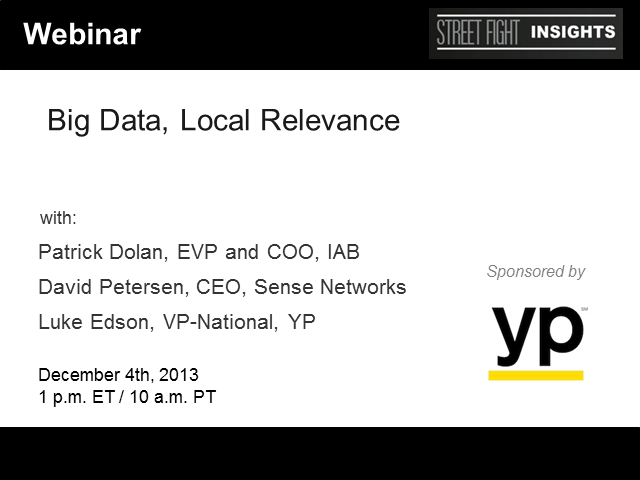 Join Asif Kahn, of the Location Based Marketing Association, and David Williams, Vice President of Demand Generation at YP for a discussion that intends to helps providers understand the state of the SMB customer base in terms of awareness of the issue, budgets, and what they need to provide to satisfy their own customer base. Mitch Bernstein, Director of Client Strategy at Neo@Ogilvy, discusses the media buyer’s view on hyperlocal, including a do’s-and-don’ts section on interactions with vendors; case studies of hyperlocal campaigns; and insight into the challenges that media buyers are trying to solve with hyperlocal. In a Q&A session following the presentation, Mitch will be interviewed by Onil Gunawardana, Executive Director of Product Management & Marketing at YP, as well as take questions from the audience. Since the days of print, content has dominated the way that people discover new places and products. But in recent years, the expansion of the mobile platform has given rise to another powerful tool: data about places, times, devices, individuals, and every action taking place within a device or those connected to it. The coupling of these two has brought about data-rich socially driven content that forms the baseline of a competitive edge in local search and discovery. In this webinar, local search expert Andrew Shotland of LocalSEOGuide.com and Sanjay Sood, VP of Consumer Platforms at YP, will focus on three case studies that represent the ways local marketing platforms can best implement content and data to improve their SMB clients' business results. Local search is not only pervasive and growing, but also changing in ways that are important for consumers, businesses and the search industry. Join Dr. Phil Hendrix, of research firm immr, and Rohan Chandran, Executive Director of Product Management at YP as they discuss the results and implications of a recently concluded study examining the ways that consumers use local search. Topics covered will include: who is searching, what devices they own, how frequently they are searching from these devices, how proximity and “urbanicity” effects consumer search habits and more.